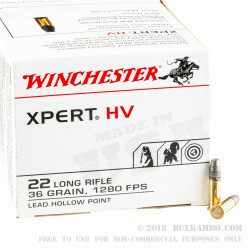 The 1280 feet per second that the Winchester Xpert HV 22lr ammo can achieve in the barrel makes it a high velocity rimfire round that has some excellent properties for functional shooting and impressive ballistics for the .22LR. 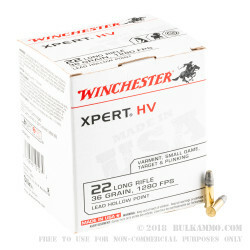 This bulk 22 long rifle ammunition is a 500 round case of 36 grain lead hollow point ammunition for the .22LR. Winchester has been making firearms and ammunition for more than 150 years. They have been around the block when it comes to making .22LR, and there have been many iterations of the .22LR across multiple lines within their portfolio throughout the years. One mainstay has always been a medium grain weight, high velocity round. This is the modern version of that mainstay. It is suitable for general use hunting with a .22LR; target and range practice to test functionality or set scopes, punch paper or whatever. The supersonic round breaks the sound barrier and creates and additional crack with the powder ignition once the bullet reaches the sound barrier. 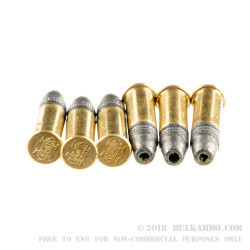 This hot round generally makes a good all-around bullet for hard to feed or hard to function firearms. 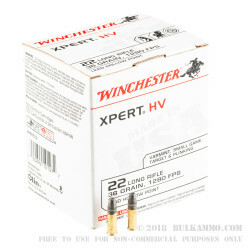 This ammo is suitable for use in any modern .22LR firearm.